EDITORIAL As March Madness draws to a close (Go Cavaliers!) dare we hope to look forward to a calm April in the office supplies industry? I fear not. Sure, things are a little clearer with regard to the fate of the wholesale channel (although a good number of questions remain unanswered), but there are still a fair few changes and challenges ahead. Buying group consolidation, trade show and meeting consolidation, dealerships merging or being bought up by the big boxes and, of course, the continued threat of Amazon. If you are worried about competing with Amazon (I doubt there are too many of you out there who aren’t) and you weren’t at the recent NOPA Fly-In event in Washington D.C. then you missed an ideal opportunity to put pressure on the guys of Capitol Hill who will be making some pretty important decisions over the next few months and years that will directly affect how competitive the IDC can be with Amazon. I understand that it is hard to get away from your dealerships and there’s precious little time to get everything done as it is. So, if you couldn’t make it have a look at our report on page 24. It highlights some of the core concerns at the moment about how Amazon is slowly tightening its grip by finding new ways to increase its market share. The piece also echoes the words of Stacy Mitchell from the Institute for Local Self Reliance who pointed out how important it is to educate your local media and politicians on the value you and other local businesses in your area bring to your communities. So, once again, if you couldn’t make it to the fly-in, start by driving down to your local town hall or Chamber of Commerce and explain why buying local adds value to a community while Amazon will, more often than not, drain it away. The year was 1959: A gallon of gas cost a quarter, Mattel introduced the Barbie Doll, the Los Angeles Dodgers won the World Series and L&L Office Supply, Inc., opened for business in Laurens, South Carolina. Lee Brouillette (one of the original L’s) had moved to South Carolina following his service in the Korean War as a Marine to be close to his wife-to-be, Barbara. Lee had come to know her when he was stationed in the area and the two settled in Spartanburg, South Carolina. Lee started out repairing typewriters and it seemed that pairing up with Larry Hatchette, the second “L,” to form L&L Office Supply was the way to go. From the beginning L&L sold the standard office supplies of the day, along with adding machines and typewriters. The two made a go of the business, but really could only afford to stock a few shelves in the Laurens retail store. After a few short years, Lee became sole owner of the business. Lee’s sons, Eddie, Joe and Steve, along with his wife Barbara, ran the business together in those early days. As their sons grew they gradually became more active in running the dealership. Today Steve and his brother Joe run the dealership; Eddie has retired. In the last three years, L&L has started to actively sell both janitorial supplies and break room products in its marketplace and has found that both categories have been enthusiastically embraced by customers. “Both categories have started to show strong growth,” said Steve, who remains optimistic about future business possibilities. Kevin Baltz (right), director of interiors, and Brett Baltz, director of business development, work to transform their customers business environments. GOS, Greer, South Carolina has introduced two beverage vans to be used by the dealership’s two full-time breakroom & office coffee service specialists. The vans will be used primarily for service trips, explained Taryn Langlade, GOS marketing manager. “The vans’ use of our signature GOS green for a nice pop, is meant to remind the public that we can take care of all of their beverage and breakroom needs,” added Taryn. Ronald McDonald House Charities is known across the country for the great work it does. Now Shad Estes, president of sales at Coastal Office Solutions, Victoria, Texas, has decided to support the annual fundraising effort of the Ronald McDonald House in nearby Corpus Christi. Shad has joined with two other local businessmen, Travis Cruger and Chris Knapick, to form a team for the Men Who Cook spring event. “It is the annual Ronald McDonald fundraiser in Corpus Christi,” said Shad. The popular spring event featured teams of three men each who prepared dishes that were served to guests at the event earlier this month at the local Ronald McDonald House. Ten teams competed and guests enjoyed samples of signature comfort food and gourmet dishes before casting their votes for their favorite teams. Each team attempted to raise the most money for the Corpus Christi Ronald McDonald House. More than paper. Peace of mind. Winner’s Circle CONTINUED FROM PAGE 8 Current Office Solutions of Ohio hosts local chamber after hours event Members and guests of the Bryan (Ohio) Chamber of Commerce assembled at Current Office Solutions in Bryan for the chamber’s Monthly Business After Hours get-together. “It is a networking opportunity where member of the chamber come to meet and get to view the business,” said Tim Martin, owner. The evening is generally a meet and greet among friends and business acquaintances. “We host it once a year on the second Thursday in March,” said Tim. Not every business wants to host these meetings but with about 100 business people attending, the event offered the dealership a great way to show its capabilities to local prospects. Employees at Eakes Office Solutions, Grand Island, Nebraska, competed in a competitive cooking contest and cemented relationships among employees at the same time. The effort was developed by the Eakes Engagement Team, who came up with a cook-off to build employee solidarity. The idea started in 2018. “Last year was a generic soup cook-off,” said Kevin Fries, human resources manager. “This year we had a theme and it was chili.” Employees from every department could participate and entrants were divided into teams with other employees from different departments. “The idea was to get people together who didn’t usually interact or didn’t interact much,” said Kevin. Seven teams were created with six or seven Eakes workers on each team. The winning chili had a rustic, backwoods sort of theme. “They decorated their booth along those lines and their chili was more on the spicy side,” said Kevin. Employees from the distribution division judged the chili and after the judging all employees were invited to enjoy chili with their lunch. numerous community events. She was a member of several bridge clubs. Memorials may be made to the Berkley Hospice in Aurora, the Denver Hospice in Denver or a hospice of choice. Online condolences may be sent to Ford-Ustick Funeral Home at fordustick.com. Key management team members: Fabricio Morales, president and CEO; Deborah Morales, general manager, Office Products Div. ; Ann Miller-Michaels, general manager, Contract Furniture Div. ; Janet Bott, CFO Products carried: furniture, office supplies, industrial supplies, janitorial supplies, coffee services Year founded: 1995 Annual sales: $50+ Million Number of employees: 110 Key business partners: S.P. Richards, TriMega, Steelcase, Indeal, HON, Kimball International, National www.fmop.com changes in customer behavior,” says Morales. “They want something quick, that’s easy to purchase.” “We need to try and stay ahead of our customers’ purchasing behavior,” he says, while recognizing that like any small business, responding effectively to what is a rapidly changing market is far from easy. “We have to keep our eyes open for any new developments we can take advantage of,” he says. Office Depot and tech support firm agree to pay $35 million after allegations of deceptive practices Office Depot and its software supplier Support.com will pay $35 million to settle Federal Trade Commission (FTC) allegations they cheated their customers into buying technology services. The FTC complaint stated that the companies tricked customers into buying millions of dollars’ worth of computer repair and technical services by deceptively claiming their software had found malware symptoms on the customers’ computers. The FTC alleged that the two companies sold the technical support services for nearly a decade using PC Health Check as a sales tool and had been aware of concerns and complaints about the program since at least 2012. The complaint suggests that rather than finding malware symptoms using the software, advice from sales people was actually based on customers’ responses to four questions put to them. As a result, it alleged that both companies violated the FTC Act’s prohibition against deceptive practices. Firstly, following a Markman ruling by Administrative Law Judge (ALJ) Dee Lord regarding the construction of some of the terms in the claim, the respondents’ Motions of Non-Infringement were granted and, as a result the investigation was brought to a close. “As the ruling on the motions for summary determination of non-infringement is dispositive as to Ninestar, Aster, and Print-Rite, and the remaining respondents have been found in default, the investigation is terminated in its entirety,” Judge Lord concluded. However, the case has been reopened following petitions from all parties for a review. The central issue at dispute is the way that the ALJ has interpreted three key terms in Canon’s original complaint—with the OEM disputing the judge’s reading of one of them, while the respondents are disputing the reading of the other two. Enter The Navigator Paper Games and start winning great prizes with your purchase points. navigatorpapergames.com THIS PROMO GOES FROM MARCH 1ST, 2019 TO SEPTEMBER 30TH, 2019. Industry vet Paul Ventimiglia joins MasterVision/BiSilque as North American Sales Mgr. partners and further build upon our community and success in 2018.” Greg Clark, president of Commercial Works commented, “The opportunity to meet and make connections with individuals from across the country with similar goals that are willing to share best practices is priceless. Learning from these industry leaders and getting to know them all while in a beautiful beach setting is a worthwhile investment of time. I am looking forward to this great event!” “The opportunity to spend three days with our customer principals individually is ideal for any manufacturer. Having this year’s meeting include field sales personnel as attendees is very exciting. This provides us with great opportunities to educate and interact with the folks who are directly responsible for product sales”, stated Kevin Glynn, executive vice president, Groupe Lacasse. Office furniture and seating manufacturer AIS has expanded its presence in New York with the recent hiring of a new showroom manager and the promotion of two team members. Chigozie Mbamalu joins AIS as manager and designer for the company’s New York showroom in Manhattan. Mbamalu comes to AIS from Coach Macy’s Herald Square, where she worked as a sales hostess and as a senior sales and training manager. Previously, she was at Pallas Textiles in New York City where she served as the on-site librarian, selected and curated textiles for customers and helped with client showroom visits. In addition, Cathy Daler, who has been with AIS since 2008 as a territory manager, has been promoted to AIS’s senior territory manager for New Jersey and AIS’s New York City showroom manager Kait Kennedy has been promoted to New York A&D representative. Committed to Your Success We’re committed to providing products and service that perform seamlessly, so your customers have confidence they’re always getting the highest quality output. From supply chain integration to custom marketing and a consultative sales team, we do everything we can to meet your highest standards. • 99.99% Jam-Free® performance guaranteed • Reliable nationwide network ensures products are stocked and delivered on time • Made with pride right here in the USA *Source: The NPD Group / U.S. Total Channel Tracking Service / Technology Paper / Based on Dollar Sales / January 2015 – January 2019. The NPD Group / U.S. Total Channel Tracking Service / Technology Paper / Recycled Post-Consumer Content: Less than 10% to 100% PCC / Based on Dollar Sales / January 2015 – January 2019. ASPEN, Boise Paper, Boise POLARIS, Quality You Can Trust, and X-9 are trademarks of Boise White Paper, L.L.C. or its affiliates. For more information on Boise Paper’s trademark use, go to: http://www.BoisePaper.com/TermsofUse/#Trademarks. The cloud’s best friend. Don’t believe cloud and physical storage go together? Well, just ask the world’s leading tech companies. Why? Because they’re using Phoenix products to keep their vital records and data safe on site. Really. They know tech isn’t bulletproof and supplementing their cloud storage with a Phoenix file or safe ensures multi-pronged protection. How is your customer supporting their cloud? Keep your reputation safe. Phoenix Safe. Minneapolis-based Katun Corporation has launched a new line of remanufactured inkjet cartridges for business printer applications under the banner of Katun Business Ink. The new cartridges claim a high level of print quality and color reproduction and OEM-equivalent yields. The line features more than 50 part numbers for use in HP and Epson applications, with additional products planned for rollout in upcoming months. These products can be ordered online via the Katun Online Catalog at www.katun.com/kolc, or through your Katun sales or customer service representative. Meanwhile, Katun-owned brand Media Sciences has released a range of compatible toner cartridges for Samsung CLP 365/CLX 3305-series machines and Samsung Xpress C430 W/Xpress 480FW-series machines. The range includes Media Sciences compatible black, cyan, magenta and yellow toner cartridges (Media Sciences part numbers 50848, 50849, 50850, 50851) for Samsung CLP 365/ CLX 3305-series machines (OEM ref: CLT-K406, CLT-C406, CLT-M406 and CLT-Y406), as well as compatible color toner sets (Media Sciences part numbers 50844, 50845, 50846, 50847) for Samsung Xpress C 430 and Xpress 480FW-series applications (OEM ref: CLT-C404, CLT-K404, CLT-M404, and CLT-Y404). These can be ordered on the Media Sciences website at www.mediasciences.com. Did you miss out on the Back-To-School supply list business in your area? Who said teachers wanted apples? Smooth, rapid drying gel ink in a premium weighted metal barrel; Zebra Pen’s Sarasa Grand retractable gel pen is perfect for front office meetings or parent-teacher conferences. Next time, give teachers what they really want. In addition to owning an estimated 40% of the world’s cloud computing capabilities, Mitchell said Amazon is also building out its shipping and delivery infrastructure to rival the likes of Fedex and United Parcel Service and also aiming for a dominant position for its operating system in the rapidly emerging Internet of Things space. Amazon has been equally aggressive on the government front, Mitchell noted. She highlighted the way Amazon secured a unique inside track within the General Services Administration (GSA) by hiring former GSA officials such as Anne Rung, previously administrator of the agency’s Office of Federal Procurement Policy and now director of Amazon Business’s government sector. In addition, she cited the current FBI investigation into possible criminal conduct in the development of a $10 billion government contract for cloud services that critics charged was structured to deliver the entirety of the contract to Amazon Web Services. “We need to see a return to strong anti-trust policies and enforcement to level the playing field relative to Amazon and big tech in general,” Mitchell said. also mentions another LinkedIn service called Talent Solutions that helps attract qualified candidates. Hughes works with local colleges and universities as sources for potential new hires. She consults with their business departments, judges student sales contests and is in the process of finalizing an internship program for underclassmen. Always recruiting new talent is printed on the back of her business cards. “If I meet somebody who is pretty dynamic when I am out, I hand them one of my cards with the back side up,” she says. She also tells them the sort of talent she looks for. Cover Story CONTINUED FROM PAGE 27 is from key indicators such as their resume and their appearance at that first meeting,” he says. Nash prefers face-to-face meetings early in the process to try to better understand job candidates. “If somebody cares about the job they are applying for, they are going to care about how well put together they appear and how well-spoken they are,” he says. Any serious job candidate should be prepared and as the meeting continues, there is generally enough time to get past obvious questions and get to know the person better. Hartsfield has prospective sales hires meet with someone on his sales staff. As he puts it, “Pick someone who knows what to do.” The interviewee is instructed to ask whatever questions come to mind while the employee is expected to talk about what it is like to work for Gazillion. After the meeting he debriefs both. “I get good input like that,” he says. really helps us get a feel for who that candidate is on a conscious and subconscious level.” To help establish benchmarks the test was administered to sales leaders at Story Kenworthy. “We found a lot of congruence with what we think we are looking for and what our performance demonstrated. So we know that the assessment tool has a high level of accuracy,” he adds. 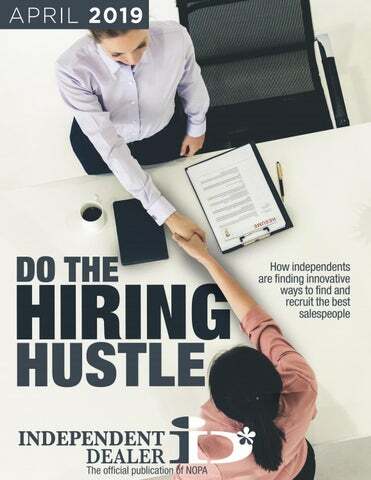 Cover Story CONTINUED FROM PAGE 28 New salespeople at Gazillion will spend a day sitting with the person who answers the phone, another day with an employee in collections and continue this round robin until they have worked in virtually every department. That time includes close to a week riding with one of the delivery drivers to learn how they work and get exposed to various customers. “I want them to know what these jobs are like and what they will need to know to set up new accounts,” Hartsfield says. Onboarding runs on a 90-day schedule at Storey Kenworthy. “What we’re finding is the higher the quality of the candidate, the more abbreviated the onboarding schedule will be,” says Dix. For part of the onboarding process Storey Kenworthy has partnered with a local training organization to provide two days on the basics. Regardless of the amount of experience they might have all new sales hires are required to attend. Sales recruits at Storey Kenworthy also do some field rides. “That way they get to see what they will be doing every day,” Dix adds. Feedback is also obtained from the tenured rep who rode with the new hire to see how they interacted with clients and their new team member. “Even though the candidate is hired, we’re still assessing their ability to perform,” Dix adds. “If we’ve made a bad hire, our goal is to fail fast and move forward quickly.” The culture at Storey Kenworthy comes with its own monetary value. Dix says that people are paid well but not overpaid because the value the dealership brings to the relationship through its culture is part of the compensation package. “There is not a dealership or big box out there that can compete with us on culture and how we treat our employees,” says Dix. He has walked away from candidates who looked good on paper but didn’t share the same values, because hiring them would have introduced conflict into his sales organization. 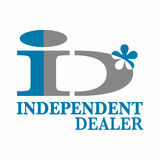 FriendsOffice is Ohio’s leading Independent Office Products Dealer. The program allows qualified individuals to work in an environment where the skills to build a career in B2B sales are developed over a set period of time. Think of it not just as a job, but also an opportunity for sales and marketing minded individuals to build a long lasting, successful career. FriendsOffice believes in putting the people we serve before the products we provide. To achieve this, we have high expectations for those with talent and integrity, while mutual respect and honesty are what make our company truly successful. Over the course of one year, you will actively experience the day-to-day life in the world of sales. You will begin to build a portfolio of business with the guidance of an experienced sales professional. The program features an aggressive, entry-level, base salary plus the potential to earn bonuses based on individual performance. Those who are financially motivated and driven to succeed can expect an above average income with us! After your Development Program is complete, you will enter into the position of sales executive with FriendsOffice. You will manage your own portfolio, prospect for new business and make commissions. Cover Story CONTINUED FROM PAGE 29 At FriendsOffice, Hughes has developed a combination recruiting and onboarding program called “Ready S.E.T. Go – Sales Executive Training.” (See sidebar) The program is posted on the FriendsOffice website and in part functions as a recruiting tool. Job postings are listed on the website’s Careers page and on the right-hand side of that page is the Ready S.E.T. Go logo, a picture of Hughes and the statement that college graduates could start a sales career with the program. Hughes has also shared the program with the universities she regularly visits. into hiring, she adds that skipping background checks is a huge mistake. “We were going to hire somebody and did a background check where major issues came up,” she says. “In today’s world it’s important. I don’t think dealers do that as much as they should.” Anderson is in full agreement. As she puts it, you have to be sure applicants can do what their resume suggests they can do. “You need to make sure that skills they have listed on their resume are truly skills they possess,” she says. She adds you need to check references and ascertain that applicants represent themselves truthfully. Michael Chazin is a freelance writer specializing in business topics, who has written about the office supply business for more than 15 years. He can be reached at mchazin503@ comcast.net. Krista Moore CONTINUED FROM PAGE 32 at answering them. Your job is to cut through all of the fluff and try to meet the real person—then benchmark them against what you are looking for. Let me give you an example: say you are looking for prospecting ability as a core competency. In today’s competitive environment, all sales people need to have honed prospecting skills to be aggressive and proactive in getting new accounts and closing business. During the interview, you should ask targeted questions to better understand how successful they are going to be in this particular area. These questions are open-ended and designed to encourage your applicant to describe experiences and stories, so you can determine if their specific past behaviors and actions are aligned to what you need. For example: •	Tell me about your experience in cold calling on prospect accounts. •	Tell me your greatest success story in bringing in a new account for your company. K.Coaching, we administer and support the DISC Assessment and make these easily accessible at IDGrowth.com. Hiring the right people is a key factor in the future success of your company. In order to find the right people, you need to know exactly what you’re looking for and be prepared to interview and assess according to the competencies that you need. Once you create this winning system for selecting candidates, you will avoid “hire remorse” and be well on your way to finding your next superstar. Krista Moore is president of K.Coaching, Inc., founder of IDGrowth Solutions and creator of the IDGrowth Sales Vault, a learning management system utilized by hundreds of independent dealers to enhance their sales strategies, training and leadership development. For more information, visit the IDGrowth web site at www.idgrowth.com. This really works! We took Southern Bell away from four other movers, winning more than $1 million of business per year using this process. Ed Katz is the president of the International Office Moving Institute (IOMI®) based in Madison, MS. IOMI® provides online office moving training to movers and furniture dealers. He can be reached at edkatz@officemoves.com, 404-358-2172. His website is www. officemoves.com.